A majority of Republicans, Democrats and unaffiliated voters now support the ballot initiative to boost public school funding through a combination of sales- and income-tax hikes. 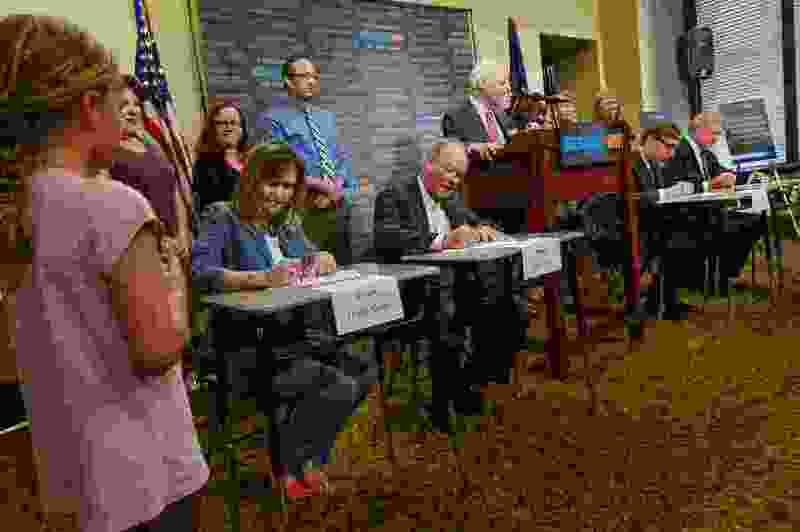 (Francisco Kjolseth | Tribune file photo) Using school desks as props, and surrounded by Alpine School District students and some award-winning teachers , Our Schools Now formally launches its tax increase initiative during a press event at the Capitol in June. Recent poll number show the ballot initiative proposal — which would raise $715 million in new money for public schools through increases in sales and incomes taxes — continues to emjoy majority support among Utahns, while opposition to the initiative is declining. Fifty-six percent of Utahns support an initiative seeking to add $715 million in annual public school funding by boosting income and sales taxes, according to a new poll. That number is in line with recent polls on the Our Schools Now campaign showing a consistent, but not necessarily comfortable, cushion of support for the proposed ballot measure. But the new survey — conducted for The Salt Lake Tribune and the University of Utah’s Hinckley Institute of Politics — also suggests opposition to Our Schools Now is eroding. Only 38 percent of Utahns say they “strongly” or “somewhat” oppose the initiative, a decline of 5 percentage points since October. A total of 803 registered Utah voters participated in the poll, conducted Jan. 15-18 by Salt Lake City-based Dan Jones and Associates. The survey has an error margin of plus or minus 3.5 percentage points. Ron Jibson, a co-chairman of Our Schools Now, said the poll results are encouraging with several months to go before November’s election. He said the focus so far has been meeting requirements to qualify for the ballot, leaving little ability for the campaign to make its case to voters. If approved by voters, Our Schools Now would lift Utah’s income-tax rate from 5 percent to 5.45 percent and boost the sales-tax rate from 4.7 percent to 5.15 percent. Those changes would be implemented over a period of three years, with new money raised to be distributed to public schools — including colleges and universities — on a largely per-student basis. With the 2018 Utah Legislature now underway, lawmakers and government leaders have discussed the potential of boosting school spending with existing resources in an attempt to forestall or impede Our Schools Now. Jibson said he appreciates the Legislature’s work on funding education. But those efforts have largely focused on keeping pace with enrollment growth and inflation costs, he said, while Utah remains last in the nation for its school spending levels. Austin Cox, spokesman for Our Schools Now, pointed to recent study by Utah Foundation that found tax policies over the past 20 years had diverted $1.2 billion away from public education. Results from the Tribune-Hinckley poll show majority support for the initiative among Republican, Democratic and unaffiliated voters, as well as for male and female voters. Jibson said the campaign is on track to complete its signature-gathering. The initiative must secure more than 113,000 signatures from registered voters in at least 26 of Utah’s 29 Senate districts. After previous polls, Perry said the initiative might be expected to shed supporters in the final weeks as voters face the prospect of raising their own taxes. But after four Tribune/Hinckley polls showing majority support, he said the results suggest that whether or not Our Schools Now succeeds, the broader topic of education funding is of interest to Utah voters.